Every summer for five days in July it is my great honor and privilege to work with high school students at the Flint Hills Publications Workshop in Manhattan, Kansas. I just finished my 12th year teaching photography at this workshop. Usually we have about 25 kids enroll in the class, but this year we had about half that. I just wanted to give a quick shout out to Marcella Brooks of Kapaun Mount Carmel High School in Wichita for winning the annual "Best Portfolio" award at the workshop. I've selected two images of hers to post here, the first of which (top) was the very first image I saw from anybody at the entire workshop. The picture has a simplicity to it that I find very appealing. It ran lead on the center spread double truck in the workshop's newspaper, The Kedzie Krier. 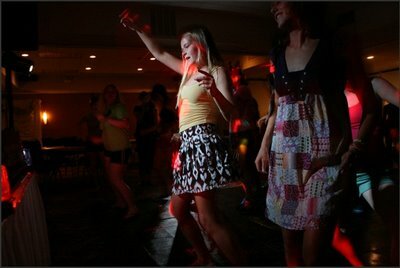 For another picture, taken at the all-workshop dance, she used the DJ's strobe lights to take the relatively mundane setting of a Holiday Inn banquet room and make it look like some ultra-chic nightclub. Marcella will be the photo editor for her yearbook this coming fall and I wish her the best. I sent her an email asking for a little back story on how she got into photography: "My photography story isn't particularly inspiring but it really started with some of my dad's old yearbooks that I came across while cleaning my attic a couple of years back. Every single picture was filled with colorful expressions that made you forget that the picture was taken in black and white. The photographer had captured all these great moments that otherwise would have been forgotten. 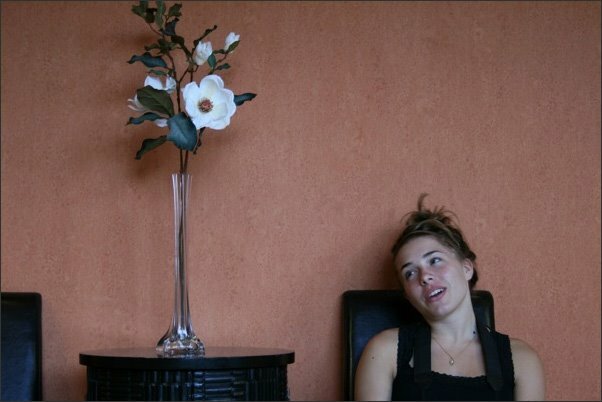 From that moment on, I wanted to be the person to take those pictures that immortalize everyone's high school years."